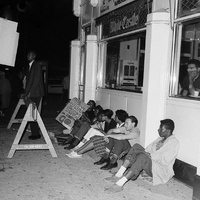 This is a photo of unidentified CORE members sitting at Bronx CORE's White Castle demonstration. The diner was located on Boston Road and Matthews Ave., in the Bronx. Bronx CORE started the campaign to convince White Castle to hire Black and Puerto Rican employees for its restaurant chain. During the demonstration, protesters were met with violence by White counter protesters including members of the American Nazi Party who fired shots at picketers in a drive by. 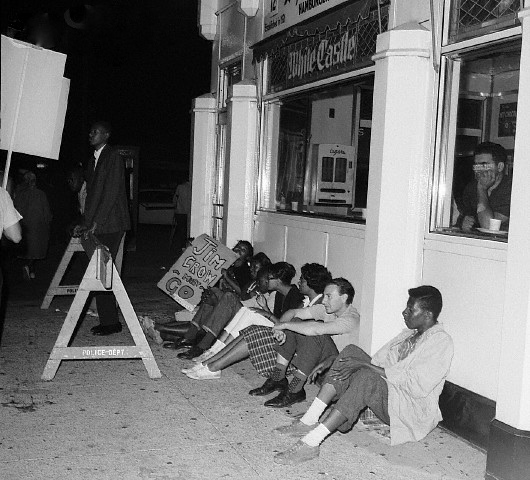 © Bettmann/CORBIS, “photo of Bronx CORE White Castle demonstration (1),” corenyc.org, accessed April 21, 2019, http://www.corenyc.org/omeka/items/show/66.